Another East Midlands Labour MP is to announce they are standing down today – that makes six. They are Pat Hewitt, Leicester West, David Taylor, North West Leicestershire, Mark Todd, South Derbyshire, Alan Simpson, Nottingham South and Bob Laxton, Derby North, who announced he would quit earlier this week. Later this morning Paddy Tipping, who has been around since 1992, will announce he will step down too. All of these guys have been around for at least 12 years each, and will be replaced by newbie candidates fighting against the odds. Their departure is a big loss for Labour, which polls show is hanging on by the skin of its teeth across the region. Batten down the hatches, the militant homosexuals are coming! They’re going to round people up, teach their kids about being gay and force you at gun point to watch men kiss. At least that’s what I’ve learnt militant homosexuals do, I’d never heard of them until Nick Griffin blurted out the term on Question Time. But having seen the light, I’m now hoarding Will and Grace DvDs in the hope of tricking any militant homosexuals who come to get me into thinking I’m on their side. Putting that weird glimpse into Griffin’s mind, and his sweaty, hand-wringing nervousness aside, the BNP leader held his own just about as well as he could have done. That is, he did as well as he could have done defending indefensible racism in a room filled with people that wanted to parade his severed head on a pole around television centre. Tonight’s show was always going to be a fight between two things – on one side a chance to spit at Nick Griffin, and on the other an opportunity to expose him as a racist while making incisive points about how it is the BNP have had electoral success. As I suspected by the end of the show Griffin was drenched in spittle. There were, however, just about enough moments to make it worth it – Griffin struggling with his holocaust denial and inappropriately joking about the Ku Klux Klan or Dimbleby pointing out the fake, palatable language used by the BNP. The thing is Griffin’s attack on immigration policy, on the Iraq War and on UK Muslims – couched in this palatable language – will ring true with some people in the UK. When these points were raised the mainstream politicians needed to break from the spitfest and engage. 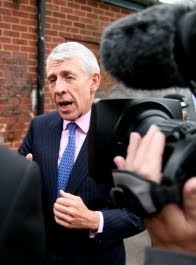 Jack Straw failed miserably, his hands tied by the fact that he can’t concede Labour immigration policy has been a mess. Chris Huhne and Baroness Warsi called Straw out and then made tentative attempts to “square up” to the issue of immigration, something which is easier to do from opposition. Baroness Warsi did at least highlight the issues of deprivation and poverty, and Huhne the disconnection from the political class, as factors in the BNP’s rise. These issues could have used a bit more time. But with so much spit to get out – it was positively bubbling from some audience members – it was never going to happen. 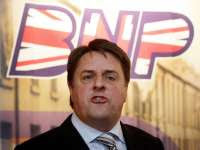 Don't Panic's latest film - probing the BNP's admission policy. Contrary to what you might think from his prosaic Commons performances Alistair Darling isn’t bad company. A few other regional hacks and I are having lunch with him later. No, it's not funded by the taxpayer before anyone asks. However, it will be a chance to ask where the taxpayer stands with a pre-budget report just a few weeks away. The CWU have just done David Cameron a right old favour. 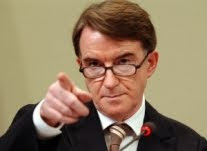 They claimed Lord Mandelson sabotaged the Royal Mail negotiations to make the unions look bad, because he’s peeved about his part-privatisation plan being shelved. 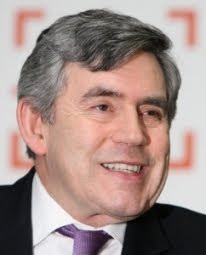 Which totally blows apart what Gordon Brown said just a couple of hours ago about the strike only being about the “modernisation programme”. It makes Brown look either out of touch or disingenuous. What was he on about! 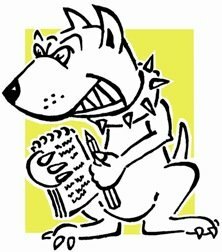 After getting an apology from Sir Thomas Legg Ken Clarke told Lobbydog: “My reaction to the original request for repayment was that I didn’t know what he was talking about. The MP was at first asked to repay £4,733, which has been revised down to £1,345. The error arose due to duplicated forms which confused Sir Thomas’ team – another example of shoddy administration in the Fees Office. The remaining repayment being requested of Clarke consists of claims made for cleaning which exceeded Sir Thomas' retrospective £1,000 a year limit. There was an interesting debate on prisoner release this morning related to the Al Megrahi (left) and Ronnie Biggs cases. Nick Palmer MP was trying to get to grips with the question of when prisoners should be released on compassionate grounds and when they shouldn’t. 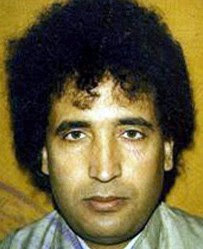 He reckoned it should never be down to a politician to decide – which given the manoeuvring around the Lockerbie bomber’s case feels like a sensible suggestion. The SNP were there and a justice minister. But it seems as though Alan Duncan, the newish shadow prisons minister, found something more interesting to do. He moseyed on down to Milbank for a slot on The Daily Politics, leaving David Burrows to fill in. Keith Vaz’s local paper, the Leicester Mercury, printed a story about a head teacher and Labour member who has quit the party. “[I am] ashamed even to admit that I live in Leicester East, let alone that I was once so supportive of you." Shop for a new Government? Who said the Conservatives weren’t a party of substance?! I don’t know. Whoever it was they obviously never went to the Conservative shop. Sorry, it's actually called 'Shop For Change'. It’s a place where you can buy an “It’s time for change” baby grow – just in case you want to use your offspring as a campaign poster. Or, if you don't fancy the tacky gimmick policies offered by New Labour, then the Tory shop has a whole range of tacky gimmicks, one of which I'm sure will be for you. Try the "honk for change" car sticker or the "big government = big problems" tea towel. Seriously though, if you are a Tory and I know you, and you’re thinking of buying me a Christmas present this year, the section on the site entitled “great gifts” should not be taken at face value. I had a chat with someone from Downing Street after it emerged that the three party leaders would NOT be giving evidence side by side to the Speaker’s conference tomorrow. Clegg, Cameron and Brown had apparently been scheduled to sit together and answer questions from the committee. However, Andrew Sparrow blogged on talk that Number 10 had kicked up a fuss about the format and had insisted evidence was given by the leaders one by one, instead of side by side – leading to “Brown chickened out” type accusations. 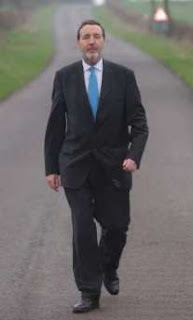 But the Downing Street spokesman claimed the Tories were playing a game of “smokes and mirrors”. In fact, the spokesman countered, Brown was the one that pushed for a hearing of some sort in the first place, and actually it was Cameron who had initially not wanted to take part, but had later changed his mind. The Tory leader was probably scared of being shown up for not having enough women in his parliamentary party compared to Labour, he said. Now, now children. Play nicely. It is a shame, though, that we won’t get to see the look on Brown’s face as he sits wedged between Clegg and Cameron. I’ve written lots of stories on the rise of the BNP and listened to endless Labour bods tell me how a “robust and united approach” is needed to counter their gains in the party’s heartlands. 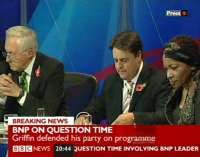 So it has irked me no end to see the cabinet sending out totally conflicting messages on whether Nick Griffin should be allowed on BBC’s Questions Time. On one hand you have Hain threatening legal action if the BNP’s leader is allowed to appear and on the other you have Straw pledging to go on and debate it out. The fight against the BNP is crying out for some leadership, but at the Lobby briefing this morning the PM’s spokesman suggested Brown was firmly on the fence – “understanding” Hain’s views but supporting Straw’s presence on the show. 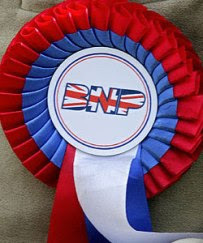 For my part there is no question about whether the BNP, fascists that they are, should be allowed on or not – of course they should, they are democratically elected. When any of us votes, we are not just voting for a single party, but for the democratic system as a whole. That system includes freedom of expression and it applies to everyone. As Mills explains in On Liberty, by letting people speak out the duff ideas can be countered, and the good ideas can be proven in debate – giving us an opportunity to believe in good ideas for more than just dogmatic zeal. In other words, it isn’t just right that all the weird, distasteful ideas are aired, it’s essential for the system. The row has given the show more publicity than it’s actually worth. Let’s hope Straw can expose Griffin for the charlatan he is. Nice to see the Sunday Times picking up on the ‘Sheerman stalking horse’ story that Lobbydog ran on Thursday and Friday. I’ve spoken to more MPs who are considering giving Sheerman their support, but it’ll be impossible to tell until the day.